This is a far cry from the slum tenements that I've previously shown (for example here and here). As you can see from its caption the photo came from the Detroit Publishing Co., a business that produced some excellent large format images of New York in the 1890s and 1910s. This is my 30th blog post showing their work. You can find the others by clicking the Detroit Publishing Co. link in the list of blogger "labels" at right. This photo's unlike the others. For the most part the firm showed exteriors — buildings, parks, blocks, riverside, and skylines. The photographic technology of the time did not favor interior shots. To get a good one you had to have a good subject, lots of natural light, and enough room for the bulky 8x10 view camera with its tripod. On this occasion the photographer was favored with all three. The rooms and their contents are fascinating, there's abundant light, and the camera fit into a dark corner or perhaps the doorway to an adjoining room. The light is particularly interesting. The sun comes strongly from our left. Presumably it's early in the morning and it hasn't yet risen far. Its light is a bit diffused as it comes in a window that's off frame to our left but shines full force through window of the back room. There's a strong secondary light source as it reflects off the wall in that room, right back toward the lens. You can see its cross currents in the shadows cast by the table legs. The HR imaging yields marvelous detail. We're viewing portions of two rooms of a city apartment. The back one seems too small to be a bedroom but it probably was. From the presence of a cook stove and of two tables (one which we see clearly and another only partly visible) we can tell the front room is used as both kitchen and dining room. It's clear the inhabitants of this apartment made the most of the little space they occupied. 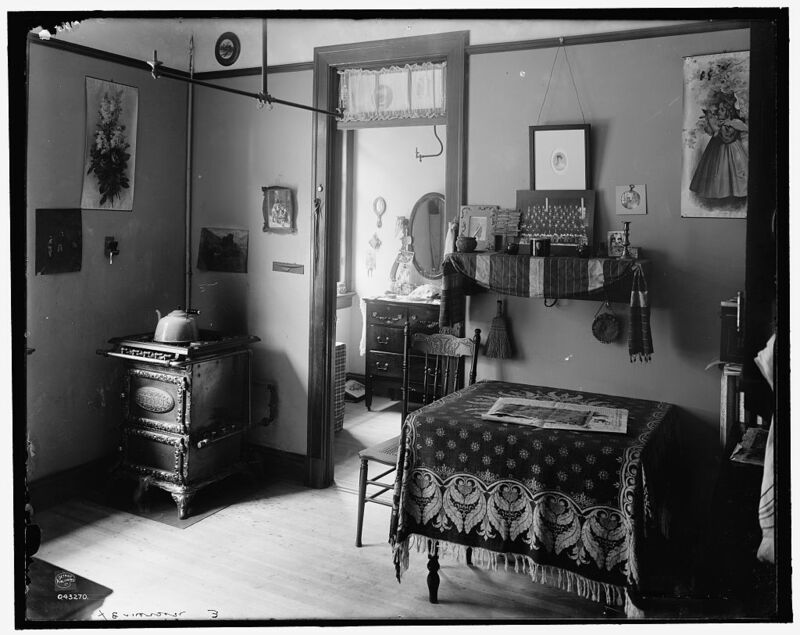 If it's typical of tenements of its time it has only one other room, a second bedroom. You can't tell whether there was a sink in this room; I think not. There almost certainly was no private bathroom but rather a shared facility down the hall. Carpets were expensive and usually a luxury beyond the reach of tenement dwellers, as seems to be the case here. Here are some detail views. As usual, you can click to see them full size. 1. The stove is compact. It runs on gas, but there was a coal stove when the place was constructed. You can tell that by the inverted pie-plate high up the wall. It covers a hole into the chimney where the stove flue used to go. 2. Here's a close up view of the pie plate flue cover. 3. On the wall just to the left of the cooker is a match holder. There were no pilot lights for the five top burners or three oven jets. 4. Just in front, hard to make out, is a pet cat. The camera was on a tripod, of course, and the exposure time was set to maybe a quarter of a second and in that time the cat moved a bit, causing the ghost image. Because of the motion it almost looks like a small dog. 5. There's so much else to see. Working from the left, I notice a battlefield picture of Napoleon on the wall. There are so many feminine touches in the photo that it comes as a surprise to see this. 6. In the corner is another somewhat masculine picture, a bucolic one showing a bovine family in a dramatic highland setting. The pipe rising in the corner to its left presumably carries gas to the floor above (gas having been put in after the building was constructed). 7. A bit more to the right we see a hull design for a sailboat. These were collected as decorations (as here), but were made to be guides for boat builders to use. Near it are a sentimental picture of children washing something (a pet? ), some scissors, ribbons or laces, and a pocket watch. 8. Further right, I notice some scrapbooks in the corner of the next room. The fact that they lie on the floor indicates to me that the apartment wasn't rearranged to make the photo more interesting but was used by its occupants just as we see it. 9. Then we see a chest of drawers with its mirror. I'd guess that after the stove, these are the most precious pieces of furniture that the tenants own. There is a lot to see on the chest and mirror; and in the mirror as well. At least one person living here has a flair for design. 10. While I'm observing these details, I've noticed the overhead gas lights. They have no mantles to capture the flames and no glass globes or shades to diffuse and redirect their light. Nighttime lighting wouldn't be very pleasant in these rooms. It wouldn't have been easy to turn on the gas and light the lamps. Presumably that task took two people, both standing on chairs — one to turn on the tap and the other to ignite the gas. I suspect the occupants simply didn't use gas light; perhaps it was too expensive. Notice in this detail that there's a pie plate flue cover in the back room. Presumably the flue pipe from the kitchen stove crossed through the next room to get to the nearest chimney entrance. That pipe would have helped heat the little room; it's now probably quite cold in there during the winter months. Notice also that the wall merges into the ceiling not in a sharp corner but in a smooth curve. 11. Here is a handsome chair and better look at the dresser. 12. By the doorway are a whisk broom and small purse. 13. The purse seems to be worth closer inspection. 14. The shelf is handsomely draped with a scarf and its contents are interesting. The occupants of this apartment seem to have at least one child, whose photo we see at left; or maybe it's two, as shown on the right. The woven-wood fan is probably the little boy's making. It seems the husband or a male relative is serving in the military, or was serving during the recently-completed Spanish-American War. There's pen and ink here by the candlestick and a Hummel-like image of children. The key that hung by the photo at right may unlock the top drawers of the dresser; it's certainly hung high to keep it out of little hands. 15. The table is nicely draped and on it we see a newspaper and something (an art project?) that's hard to identify. There's more to see, but I leave that to you. Cranch says the flue covers "had spring clips on the back that snapped into the circular opening." Anonymous Tipster notices that the newspaper is Hearst's Evening Journal and says it was begun in 1895, became the Journal-American in 1936, and ended life in a complex merge into the World-Telegram and Sun and the Herald-Tribune. This person also says "The thing reflected in the mirror appears to be a yarn swift, or winder. The bag would be used to store it." The floor plan of a typical "dumbbell" tenement also called an Old Law Tenement was different from the floor plan of our tenement. Dumbbell buildings were constructed throughout New York between 1879 and 1901 in an effort to make apartment buildings healthier, safer, and generally better than they had been before. Here's a typical dumbbell floor plan. Here, I have modified the plan to show a plan that's closer to our tenement's (in oval at top left). In both plans, the small bedroom is quite tiny. This is an 8x10 view camera of the type that the photographer might have used. It was loaded at back, one plate at a time, and could only be used on a tripod. nice photos and great camera. Click here to retrieve my email address. I've done a set of posts reproducing parts of this diary and giving notes on people, places, and events that it names. The author was an aristocrat in England writing just before the outbreak of the American Revolutionary War. Married to an ambitious politician who opposed the government's coercive actions leading up to that rebellion, she was an articulate, self-confident, and intellgent witness to the major events and lesser incidents of her time. Here are links the posts: first, second, third, fourth, fifth, sixth, seventh, eighth, ninth, tenth, and eleventh. I've also done the following posts giving what little I can surmise about her from reading the diary, the biography in which it's reproduced, and the few other sources that refer to her: Diary of Lady Shelburne -- Une belle Ladi Sensée, Diary of Lady Shelburne -- The Life of Sophie and William, and Diary of Lady Shelburne - Thomas Coulican Phoenix.